The Church of England's governing body has taken its first step towards allowing women bishops into the Church. The general synod has voted to continue its debate about women bishops in the summer, when a vote in favour could see women being consecrated by 2011. Some clergy argue the issue will divide the Church and puts the "aspirations of humankind" ahead of God's own agenda. But Women in the Church chairwoman, Christina Rees, said it had "nothing to do with aspirations for women". "We have a Church that wants to be representative of the whole people of God," she said. Opening the debate, the Bishop of Rochester, the Right Reverend Michael Nazir-Ali, said many of the same points had been made during the debate about the ordination of women priests. But some of the arguments were now "presented with a fresh emphasis or with renewed vigour" he added. Summarising the position of those in favour of women bishops, he said they believed the church is "damaging its credibility" by preventing the move. Synod member Anne Foreman agreed, saying the inclusion of women would spread the gospel in "fresh ways". She added: "I have seen the face of Jesus reflected in women as well as men and I want to see bishops who are women." Bishop Nazir-Ali said other members believe the church is already divided and are asking: "Is this really the time to introduce another cause of division?" The Reverend Richard Seabrook agreed, telling BBC News the issue would further divide the church. "Sometimes I think that we put the aspirations of humankind before the aspiration of God for his Church." The Church's first female priests were ordained in 1994 - but Mr Seabrook said people who disagreed with that decision "have not gone away". "The danger is if we admit women to the episcopate all of a sudden we are going to have lots of people driven further away from the church," he said. Another synod member said 1,000 parishes said they would not even accept women as priests. 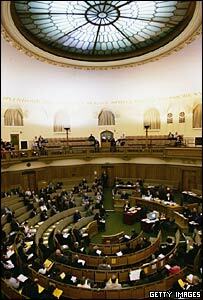 The vote comes after the House of Bishops published a report outlining the theological arguments over the issue.